The Winnipeg Folk Festival has announced its 2019 lineup, and it's bursting with A-listers. 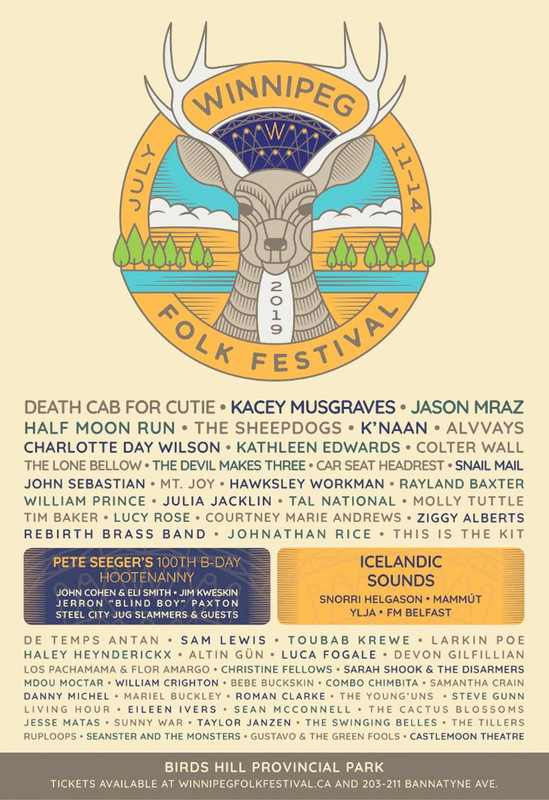 Playing the fest this year are the likes of Death Cab for Cutie, Kacey Musgraves, Jason Mraz, Half Moon Run, the Sheepdogs, K'naan, Alvvays, Charlotte Day Wilson, Kathleen Edwards, the Lone Bellow and many more. The 46th edition of the fest goes down from July 11 to 14 at Birds Hill Provincial Park in Winnipeg. There will be more than 70 artists playing the event this year. In addition to all those aforementioned acts, other festival performers include Car Seat Headrest, Snail Mail, Hawksley Workman, Tim Baker, William Prince, Tal National, Lucy Rose, Johnathan Rice and even more. There will also be two special workshops at the festival: Icelandic Sounds and Pete Seeger's 100th B-Day Hootenanny. You can see the full lineup below and head here for more festival info, including ticketing options.